If you’re going to come up with your own idea of a small business, then you don’t just go into it thinking that it’s going to be easy. For example, if you’re going to open up your own nightclub, there are a ton of factors that could determine its success. you may also see plan templates. It can be anything from the location, the type of people that it will cater to, what it’s going to sell, and much more. This is the reason why you’re going to need to come up with a business plan that will help ensure that you can set up a nightclub that a lot of people will think of as a winner. As its name states, this the section where you summarize everything about your personal business plan all on one page. This is where you’re going to place the name that you have come up with for your business, the ideal location that it’s going to be situated in, the types of products and services that it’s going to sell, your ideal customers, and much more. Remember that it’s a summary, so the information that you are going to provide here shouldn’t be long. Also, you want it to be as interesting as possible. The reason for this is because the summary is meant to attract potential investors by providing them with something that will give them an impression that your business is one that they should invest in. 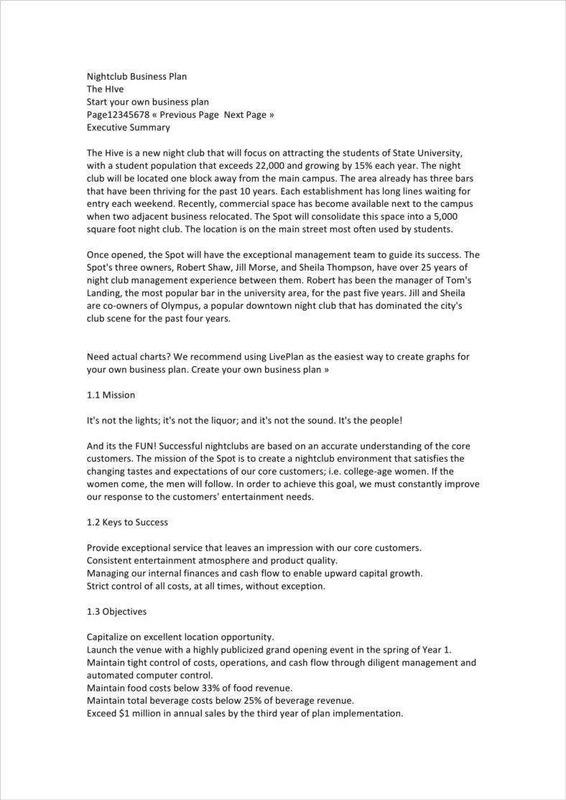 Be sure that this section is well-written as this is what will determine whether your potential investors are going to keep reading, or if they’re going to put down your simple business plan in the hopes of finding another nightclub idea that’s well worth their time and money. This is the part where you go into detail regarding the type of nightclub that you want to have. This is where you point out what your nightclub is going to focus on, the goals that your nightclub is going to achieve, and the means by which you are going to achieve those goals. If potential investors see that you’ve put a lot of thought into what it is your nightclub is going to be, then it will give them the impression that yours is one that has the potential to be successful. This is especially true if they are able to see that yours has something that differentiates you from all of the other nightclubs. You may also like free business plans. A description of all the products and services that your nightclub is going to sell. Remember to take into account all of the drinks that you’re going to sell since it’s most likely the main focus of your nightclub. 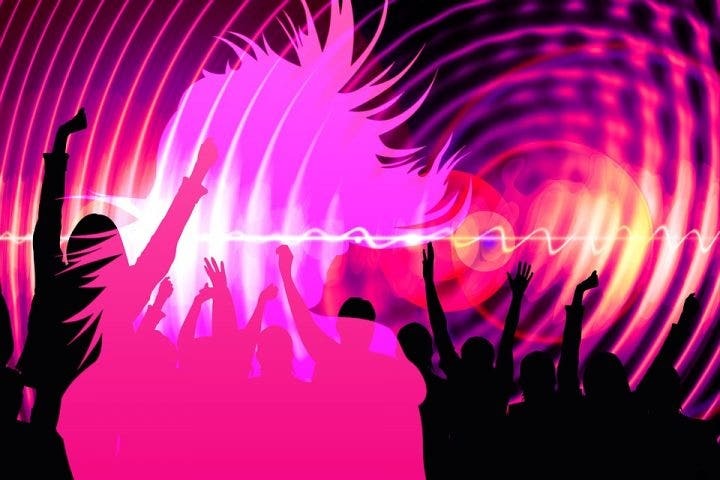 A detailed price list of all your nightclub’s products and services. Be sure to state that your products and services might be subject to change if ever their market prices suddenly lower or drop. Whether you will be the ones to create your own products or if you plan on buying them from a wholesaler so that you’re going to resell them to your customers. If your nightclub has any services that it’s willing to provide to its customers, then you’re going to have to provide a short description of each of these services. You may also like a business plan for mac. Provide a description of the ideal customers of your nightclub. This can be either men or women, but just make sure that they’re over the age of 18 considering that a nightclub would usually involve alcohol. When you’re describing who you want your nightclub to cater to, you have to be as specific as you can. You don’t just say that your nightclub is mainly for “men and women”, you want it to target a specific type of guy. Like for example. if yours is one that focuses more on people who are single, then you can describe that you can add a description that points out that your nightclub is “one for the single ladies and gents to get along and mingle,”. You may also like hotel business plans. Information regarding the buying behavior of your target market. Are the people in your nightclub going to be the ones to order what you have? Or are you going to have to come up to them and ask them what they want? Do you think that they’re going to frequent the bar? What if they decide that they would rather just dance in your club, does this mean you’re going to have to charge entrance fees? You’ll need to know the answer to these questions as this is what will help you come up with ways in which you will sell what your nightclub has to offer. You may also like startup business plans. If you know that there are other nightclubs within your area that’s doing good business, then you’re going to have to do your market research in figuring out how it is they manage to stay relevant. You might see that there are some that are struggling in the industry and then there are those who are so popular that you want your nightclub to be just like theirs. In any case, whatever you learn from these two will definitely be very helpful as both can provide you with information that your business will benefit from. By learning what isn’t working for those failing nightclubs, you can avoid the mistakes that they have made. By understanding what the successful nightclubs have been doing, you might be able to learn a thing or two that you can implement on your own. But the most important thing that you’re going to have to figure out is what makes your nightclub unique from the rest of your competition. Is there anything that makes yours special or that can give you a competitive edge? If so, then how are you going to use it? Some nightclubs have gimmicks or promos such as having free drinks for women on certain dates or men getting a certain discount if they bring their significant other. Just make sure that the method you use to get you ahead of the competition is one that will still net you a profit. Otherwise, it’ll all be pointless. You may also like sample business plans. If you open a nightclub, then you expect people to be pouring in. That won’t exactly happen if you don’t even know how to attract people into coming into your establishment. You want to people to get invested into what you have to offer, so you’re going to have to find the best methods in which you will tell these people that your nightclub is there ready and waiting for them. So you have to think of what methods will best suit your target market. For example, yours is one that caters to 18-year-olds and those in their early 20’s. These are the type of people that frequent social media, so you come up with a Facebook page and make posts in regards to your club. You may also like business plan maker. The section wherein you’re going to have to show who’s in charge of management and the employees that you’re planning on hiring. You need to provide their bios here as well as their job descriptions. Then once you’re done with that, you’ll need to show the day-to-day operations of your nightclub. It’s best that you come up with a detailed list of how things are going to run and who will be in charge of what. Investors will heavily look into this as this part is crucial for any business. Now, this is something your investors will be interested in the most. They’ll want to know just how much your business might make, the expenses it will take to run your daily operations, the expected expense and revenue within the next three years, and your credit report (if required). They’ll also want to learn about their possible return on investment as they’ll want to gain money from your nightclub if they see that it becomes a big hit. So, make sure that you provide all of that information. If you would like to learn more about this particular topic or anything related to it, then all you have to do is go through our available articles until you can find those that have the information you need. 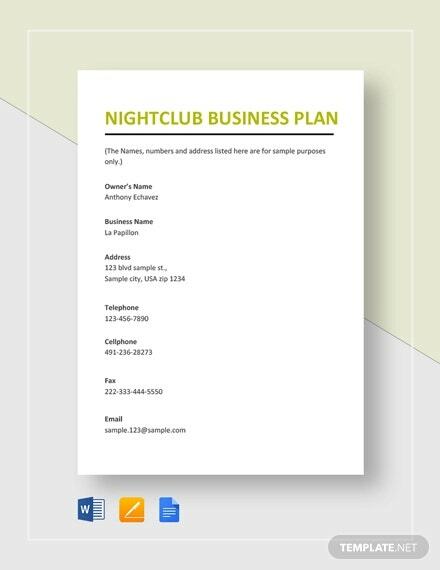 You may also see restaurant business plans.